The Gaspésie begins in Sainte-Flavie or Mont-Joli via Highway 20, where Route 132 splits into two to form an itinerary loop of 885 km. It was at this point that you must choose your route: South or North. There is no better route, you are assured of magnificent views, from one side to the other. 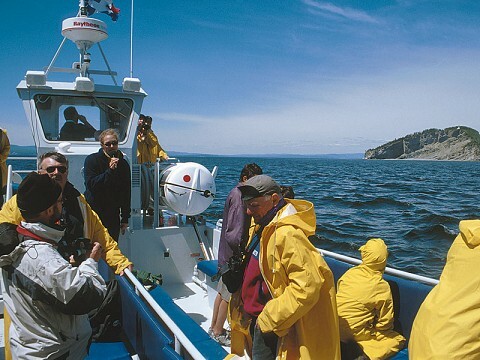 The Gaspésie covers 30 340.6 km2, and its population numbers 132 700 inhabitants. This area roughly corresponds to that of Belgium, which, however, has a population of 10 million souls. The Peninsula is bordered by the North by the St. Lawrence estuary, to the South by the Chaleur Bay and to the East by the Gulf of St. Lawrence. 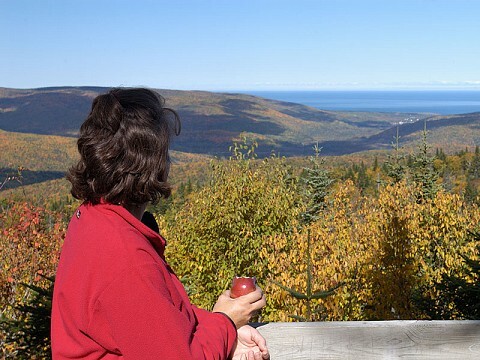 This vast territory is divided into five regions: The Coast, the Haute-Gaspésie, Land's End, the Chaleur Bay and the Matapédia Valley. If you feel like taking a break or require assistance while on the road, look for the Village-relais signs. These point to towns that, together with local businesses, offer a range of accedited services and a safe and pleasant place to stop. villages-relais.qc.ca. Bring warm clothing and a wind-breaker to ensure maximum enjoyment of a boat ride and evening walk along the dock or a mountain hike. In autumn, allow boots if you want to go hiking, snow comes early in national parks and on the summits. Please note that dogs are not allowed in national parks and wildlife reserves of the SÉPAQ. Everywhere, must be on a leash and pick up his small needs. If you were to leave your dog alone, do not leave it in the car with high temperature. Always choose a shady place to park the car or install sunshade. This will prevent heat stroke which well bring inconvenience to your pet. Several accommodations and all campgrounds accept pets, look for this symbol on this website. For more information www.partoutavecmonchien.com. From mid-July to mid-August, it is important to make your accommodation reservations in advance as this is a very busy period. This approach will avoid many inconveniences. Depending on temperature, the beautiful time to enjoy the fall colors is between late September and mid-October. The mosquito season varies from year to year, dépendemment the weather, but it is located primarily between late May and mid-July. Do not forget to bring your mosquito repellent. Tipping is customary in restaurants, bars and taxis. The amount, which is not included in the bill, generally represents 15% of the total bill before taxes. For quick tip calculations, Quebecers normally add up both taxes. Tipping bellhops or porters is at your discretion (generally, $1 per bag carried). Two taxes apply in Québec: the federal goods and services tax (GST), of 5% and the Québec sales tax (QST), of 9.975%. A tax on accommodation of 3% of the room price per night also applies in Gaspésie. To plan your travel or for information on road conditions, call 511 or 1 888 355-0511 or visit quebec511.info. It is possible to go around the Gaspésie with your electric vehicle. Visit www.lecircuitelectrique.com to find the charging stations. Since Canada uses the metric system, speed limits and distances are indicated in kilometres per hour (km/h) and gasoline is sold by the litre (l). Use of a hand-held cell phone that does not have a "hands-free" function is prohibited while driving. Winter tires: From December 15 to March 15, all taxis and passenger vehicles registered in Québec must be equipped with winter tires. This requirement also applies to rental passenger vehicles in Québec.